Chickpea cookie dough is for those of us who can’t seem to get the cookies in the oven. Love to eat cookie dough out of the bowl? Well, I have a solution for you! And, get this, it involves chickpeas. I am sure that when Toll House hears about this - they will start including chickpeas in their famous chocolate chip cookie recipe. If you are interested in a recipe without chickpeas check out my frozen cookie dough recipe. It is a great one for portion control! This is vegan chickpea cookie dough - no butter or eggs are used to make this work. You do have to ensure that you use vegan sugar. This recipe also involves just one bowl (your food processor) and zero cooking. Think of it like "cookie dough hummus". This is seriously fun to make with the kiddos. I love how easy this is to make. 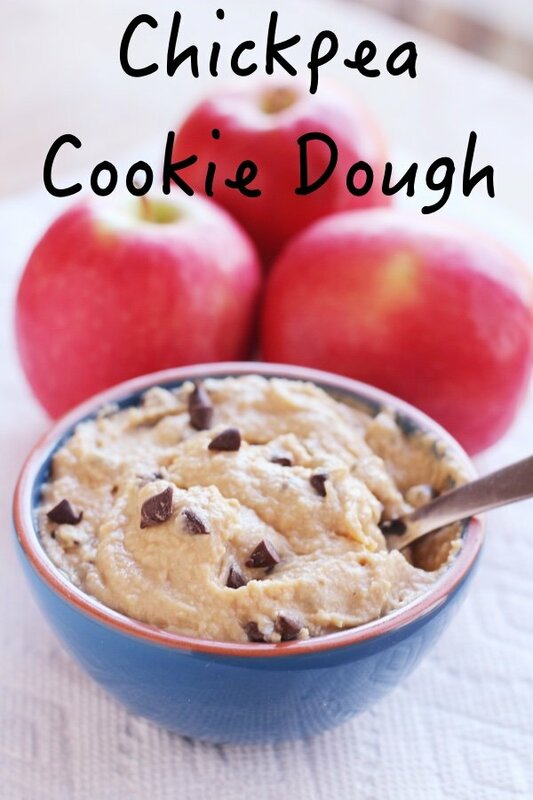 It is actually much easier than actual cookie dough. There is 1/4 cup of sugar in this recipe (or it wouldn't work) and it boils down to about 1 teaspoon of sugar per serving (1 tablespoon). 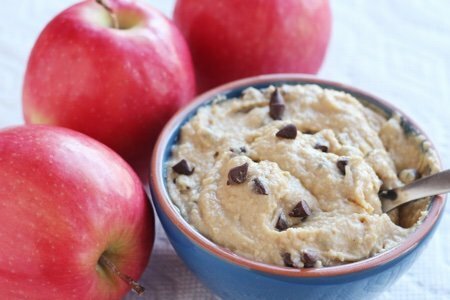 Keep in mind that if you compare it to regular cookie dough (with the butter and eggs) you are doing much better in terms of saturated fat intake with this dip. Serve it at a party and don't tell anyone about the chickpeas! 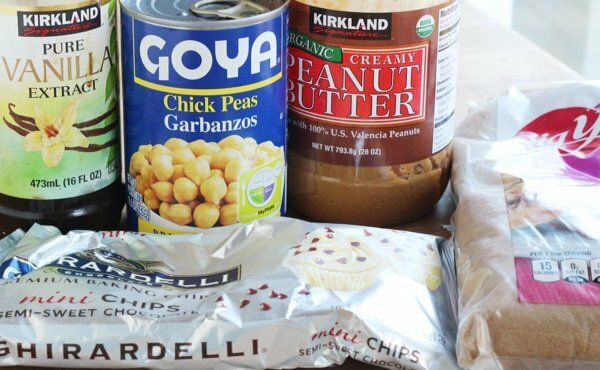 You could have a game - "name the mystery ingredient in the cookie dough dip" and the person who guesses correctly gets a can of chickpeas. No one will accuse YOU of having dull parties. My husband does think this recipe is a little strange but he never is tempted to eat raw cookie dough. I’m not sure why that is. Perhaps there are people who like baked cookies more than cookie dough (though I think he may be the only one). Have you made chickpea cookie dough? What did you think? Have you tried chickpea cookie dough? Drain and rinse chickpeas. 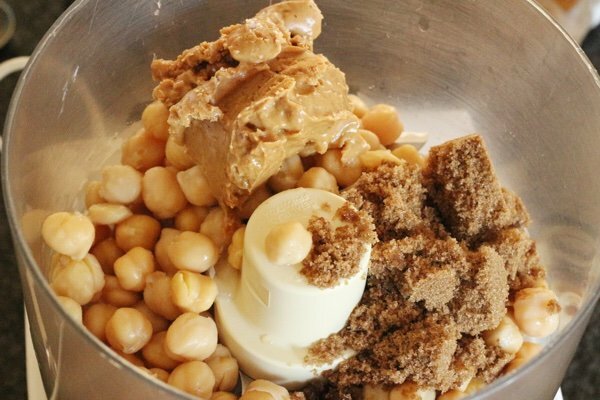 Blend chickpeas, sugar, almond milk, peanut butter and vanilla in a food processor or highspeed blender. Mix in chips using a spoon and serve. Store in refrigerator for one week. I wonder........could it be baked? Not a fan of raw cookie dough and I know that the point of this recipe is to have the "raw cookie dough" experience :~)! I have a similar recipe that can be eaten raw or baked. The cookies are soft when baked but they hold together nicely and are really good. This looks delicious. I love chick peas. I think I will use coconut milk and some almond or coconut flour and erythritol (zero calorie sweetener) because that is what I have on hand. With the flour, I will bake a few minutes. Thanks for this recipe. I tried this "cookie dough" having some as I write. For me it's exactly what I need when I get that "I need something sweet." A tablespoon or two is quite satisfying. Thx for sharing. Can't wait to try this. Going to try half with some almond flour to make cookies. I had a question, a friend of mine is allergic to both almond and soy, do you think coconut milk as a substitute would work just as well? @Jessica - I do think coconut milk would work. Thanks for your question! Sounds delicious. Could you substitute PB2? If so could you just add the powder to the mix and how much would you suggest? Katherine, just reconstitute the PB2 according to directions and use 1/4 cup according to the recipe. Even if you use more it should still be fine. This is as awesome!!! Thanks so much!! !